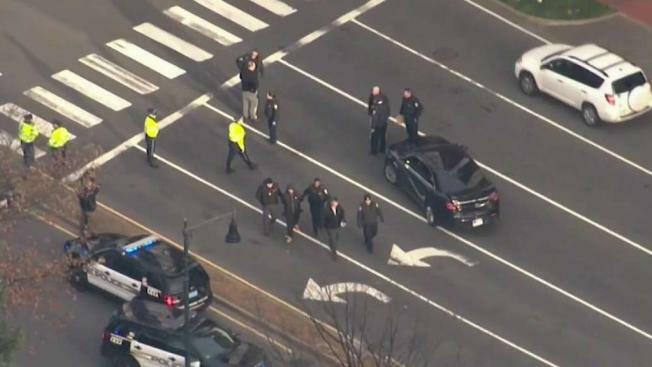 Gunshots erupted Thursday afternoon on the streets of Cambridge, Massachusetts, in what the police commissioner described as "a moving gun battle." Police say they responded to the reported gunshots at about 2:35 p.m. in the area of Chestnut and Sidney streets where occupants of two vehicles were allegedly shooting at each other. The incident started near Brookline and Chestnut streets just steps away from a daycare, which immediately went into lockdown. "We had heard a few gunshots and we just didn't know what happened so we came out because we just wanted to know what had happened and unfortunately my car was involved," said Crystal Ventura. Police and witnesses describe what took place in Cambridge after a shooting happened earlier today. Ventura's car was hit as the two cars, still exchanging gunfire, took off towards Central Square. After another five shots were fired in Central Square, a Cambridge police officer who was heading into work spotted the two cars and called in for help. The chase finally ended near Cambridgeside Galleria when police surrounded one of the two cars. One of the two people inside the stopped vehicle was arrested. 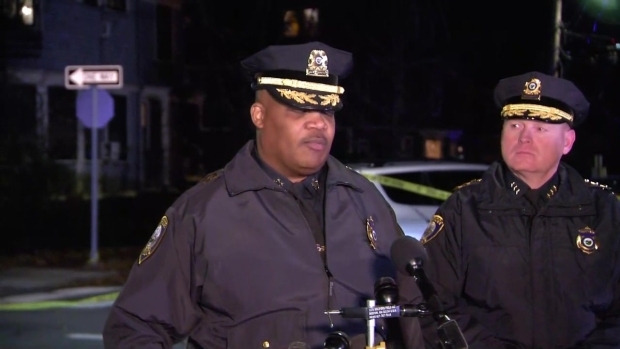 Ladjuan Guichard, 20, of Roslindale, formerly of Cambridge, was taken into custody in the area of Lane Boulevard and Binney Street, according to police. Authorities say a firearm was recovered off of Memorial Drive. Guichard's charges include discharging a firearm within 500 feet of a building and carrying a firearm without a license. The second person in the vehicle is a male victim from Cambridge who was taken to a local hospital for treatment of a superficial gunshot wound. He has not been charged at this time. Cambridge Police Commissioner Branville Bard describes the scene in which occupants of two vehicles were engaged in a gun battle. 2 suspects were arrested from one of the cars, while another suspect is being sought. "You have folks brazen enough to discharge on the middle of the highway it's disturbing," a police officer said. There was another vehicle involved in the incident, and police are still looking for additional information on that vehicle and the individual or individuals inside of it. "It's disturbing. It rips at your feelings of safety. Broad daylight, middle of the afternoon on a school day," Cambridge Police Commissioner Branville Bard said. "You've got people brazen enough to discharge weapons." Bard said approximately 12 shots were fired during the gun battle. The incident is under investigation. Anyone with information is urged to contact Cambridge police at 617-349-3300.